Cloud applications are complex with many moving parts. Monitoring provides data to ensure that your application stays up and running in a healthy state. It also helps you to stave off potential problems or troubleshoot past ones. In addition, you can use monitoring data to gain deep insights about your application. That knowledge can help you to improve application performance or maintainability, or automate actions that would otherwise require manual intervention. 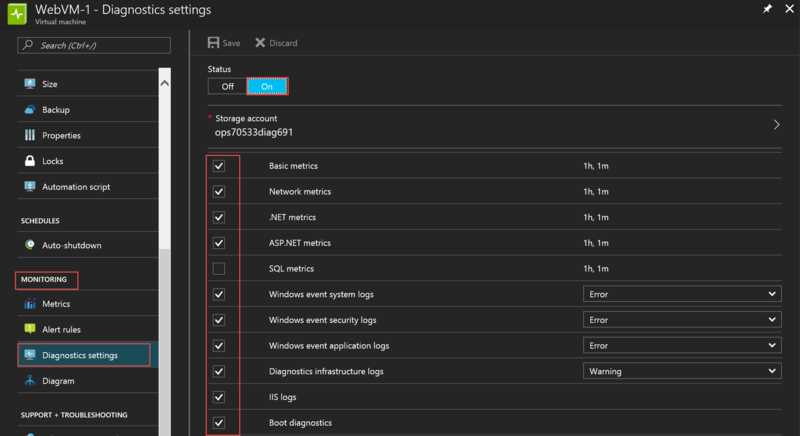 In the Azure portal, navigate to the virtual machine, select Optional Configuration, then Diagnostics and set Status to On.Upon completion, the VM has the Azure Diagnostics extension installed and running. This extension is responsible for collecting your diagnostics data. 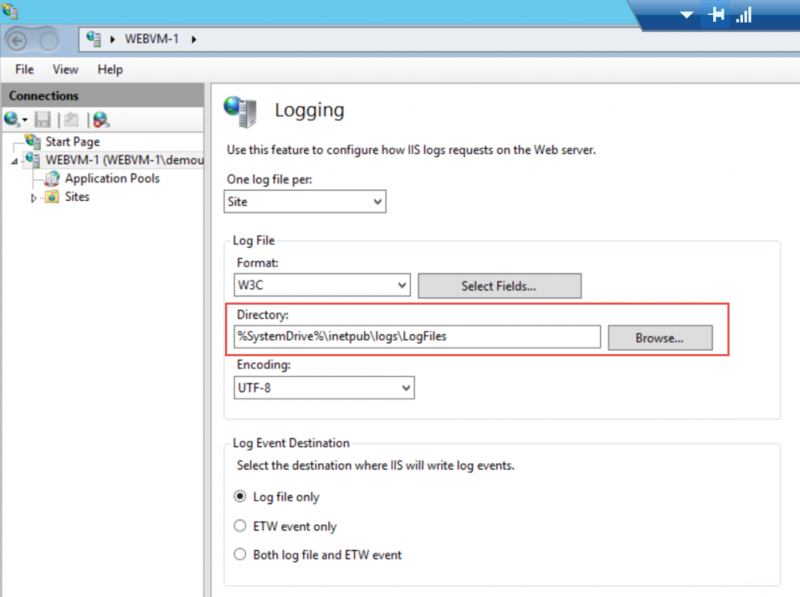 Enable monitoring and configure event logging on an existing VM. You can enable diagnostics at the VM level. Set the Status to ON. Configure the storage account you want to use. Select each diagnostics log that you want to collect. As soon as this had been set, all the selected data will be captured and stored in the storage account. Visualizing your monitoring data in graphics and charts helps you find trends far more quickly than looking through the data itself. Monitoring data is typically written to Azure storage and kept there until you delete it. 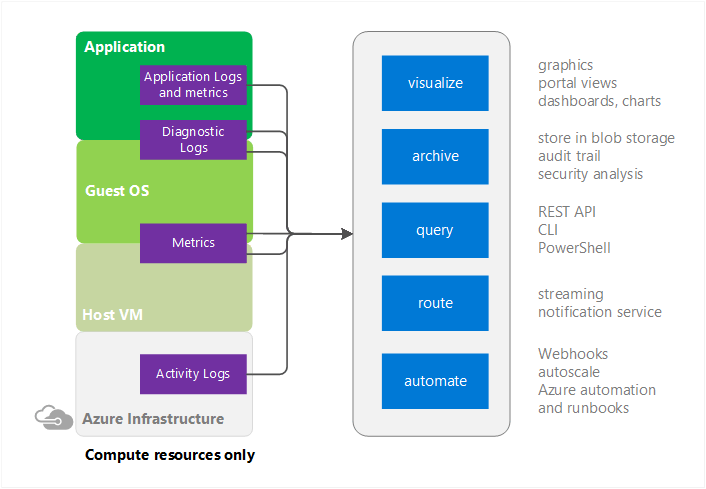 Once written, you can have other tools within or outside of Azure read it and process it. You download the data locally for a local archive or change your retention policy in the cloud to keep data for extended periods of time. You leave the data in Azure storage indefinitely, though you have to pay for Azure storage based on the amount of data you keep. Creating custom queries and sending that data to a third-party application. You can stream monitoring data to other locations in real time. Send to Application Insights so you can use the visualization tools there. Send to Event Hubs so you can route to third-party tools to perform real-time analysis. Use data to autoscale compute instances up or down based on application load. Send emails when a metric crosses a predetermined threshold. While this is pretty amazing what you can achieve with this, there is 1 caveat that you need to be aware of .. The reason herefor is that the Azure IIS monitoring moves ALL files it finds in this location to the diagnostic storage account! While you are able to use tools to read out Azure Storage accounts (Azure Storage Explorer), this might not be a wanted situation. Big thanks to Paul De Jong for pointing this out to me!